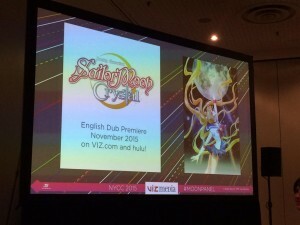 The latest episodes of Sailor Moon Crystal aired on Japanese television on April 25th at 11pm Japan Standard Time and was available to stream on Crunchyroll, Neon Alley and Hulu following that around 10:30am Eastern Time that same morning. I watch the show on Crunchyroll due to the quality of their feed and the fact that as a Canadian it’s my legal option. This week’s episode, Act 29, Infinity 3 – Two New Soldiers, has Usagi struggling with the kiss she shared with Haruka. 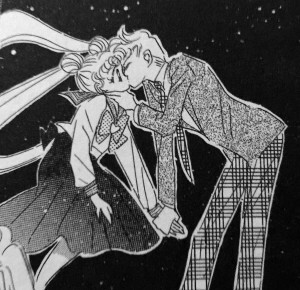 The kiss is meant to occur early in Act 29 of the manga but, like most of this story arc’s episodes of Sailor Moon Crystal, the last episode ended with a scene from the next act. The clip before the bumper however shows us the kiss again and we see this time that Sailor Moon has a blushing reaction to it. This insinuates that she liked it and Usagi will be dealing with these feelings throughout this episode and the rest of the season. Is Usagi gay? Classifying her as such doesn’t seem to be terribly helpful. 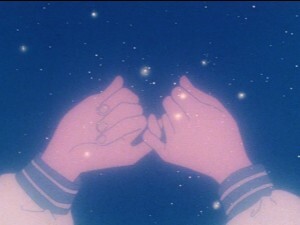 Sexuality is fairly fluid amongst the characters in Sailor Moon, which reflects real people’s feelings quite well. Usagi loves Mamoru and her dedication to him doesn’t really waver. She has also been shown to find other girls in the series attractive, most prominently Rei when she first showed up, and here she is clearly attracted to Haruka as well. 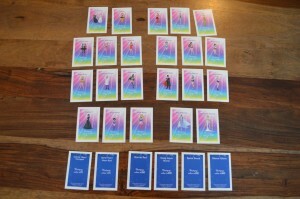 Beyond this other girls in the series have feelings of attraction to other girls. Haruka seems to exclusively like girls. 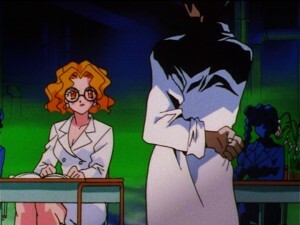 Michiru loves Haruka but also seems attracted to other men. While many of the women in the series are attracted to men, they are comfortable in also being attracted to women. This really is a great way to portray characters as they aren’t terribly bogged down by labels or preconceptions. No doubt viewers and readers dealing with similar feelings appreciate seeing such things portrayed in a series they watch. Everyone is sharing the same dream in this episode. 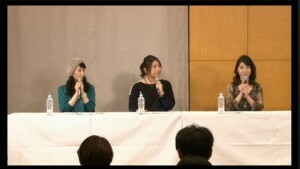 Last week we had a few people having a shared dream, voiced by Hotaru, but it was somewhat limited. 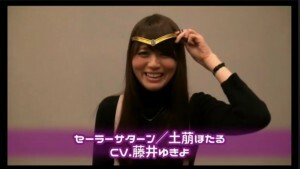 Here all of the main Sailor Guardians are getting the same dream this time voiced by Haruka. Things are so different in an anime series than in a manga. If we see a statement made on the pages of a comic we don’t really know who is saying them. 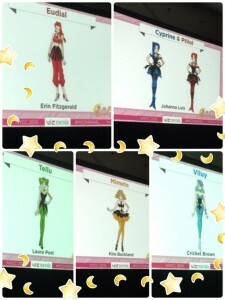 In a series with voice actors there’s a bit more revealed. The dreams are all about talismans, and no one seems to know if they are good or bad, or what they should do about them. Not really useful. 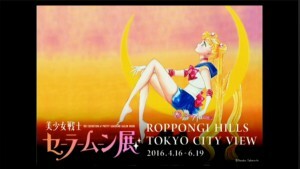 The real prophetic dream which we see is Usagi’s vision of Haruka. She’s dreaming about her kiss and seems to have a good idea that Haruka is the Sailor Guardian who kissed her. She sees here as male and female but the female version she sees has a scarf and vest which aren’t actually seen until later in the episode. Sounds like some magic dreaming prediction! Of course in a series full of magic with dreams already predicting the future in this episode, this explanation doesn’t seem to be terribly out of place. While discussing Mugen Academy the cats mention the Tokyo Bay reclamation project. I didn’t really understand what this term meant at first so I looked it up and in this context it’s referring to filling up the Bay with some sort of fill to make new land and building that up. This certainly makes sense in the context of what is going on. We’re in downtown Tokyo which is space which has been inhabited in some form or another for hundreds of years. It doesn’t make sense that there would be room for all of these new constructions but if Tokyo Bay was filled in to do this, we understand where all of these buildings are coming from. There is a lot of precedent for this in the real world as a lot of Tokyo Bay is reclaimed land, which has changed the shape of the shore line over time. About 250 square km (100 square miles) have been reclaimed from Tokyo Bay. 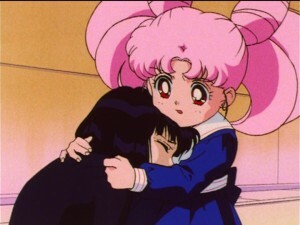 Chibiusa is all about secrets this week! Hotaru totally knows her secret and then Hotaru basically tells her that her father is making monsters. This should be a big deal and if Chibiusa acts on this it’s game over for the season but she doesn’t. 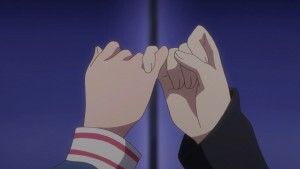 When she seals the promise with Hotaru they lock their pinkies. This reminds me of Kazuko and Hiromi from episode 21 of the original anime, Protect the Children’s Dreams: Friendship Through Anime. 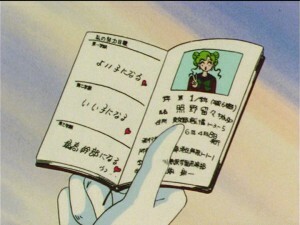 When Chibiusa goes on a helicopter ride she promises not to divulge what she discusses with Haruka or Michiru. Why are these two even taking this gamble? We will see next week how well she hides this. Chibiusa seems really impressed with flying in a helicopter. Normally I would agree that this is a big deal but let’s not forget that Chibiusa literally flies through time, so I’m thinking a helicopter ride to her would be like me going for a horse pulled wagon ride through an overgrown pumpkin patch. 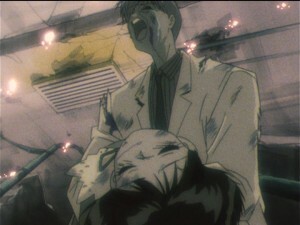 The helicopter drops Chibiusa off in the middle of the street and the townspeople are rightfully disturbed by this. There’s a concert. Actually there are two concerts. These are in the same building on different floors at the same time. How practical is this? You know when you’re in a movie theatre watching a quiet drama and in the next theatre there are a bunch of Autobots killing Decepticons and you can hear the vibrations from the explosions coming through? 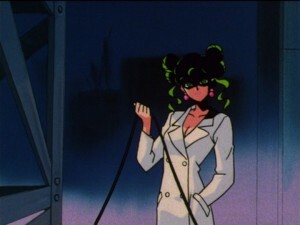 I imagine Mimete’s loud pop music in a massive auditorium might have some bleeding out onto the classical violin performance that Michiru is doing. Anyway there’s a bunch of drama over tickets here! 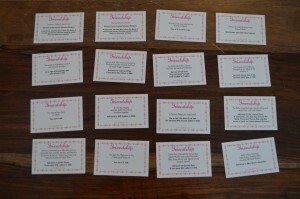 Haruka gives Usagi a bunch, which she shares with her friends, but in comes Mamoru who got tickets from Michiru. He was going to share them with his girlfriend, but she’s already going so he takes Chibiusa. Rather than communicate, which good couples should do in order to avoid misunderstandings and conflict, he just doesn’t say anything and runs into her at the event. Good plan bro! There are all sorts of concerns going on now with Usagi having been kissed by a girl and Mamoru maybe doing something with Michiru. 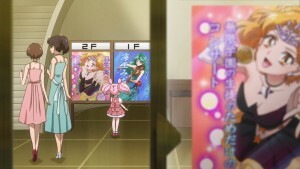 While everyone but the cats seemed covered with tickets for Michiru’s concert, the real show that Minako wants to see if Mimete’s. This is a concert which is offered free to Mugen Academy students and in order to prove your attendance to that school you seem to only be required to wear a school uniform. 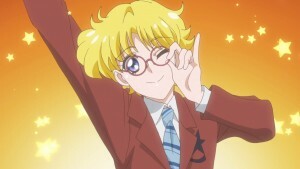 Minako has a plan which involves using her old compact from her Sailor V days. The Sailor Moon manga follows the Sailor V manga, but Sailor Moon Crystal hasn’t really touched on this much. In Codename: Sailor V Minako would use this to transform into various things much like Usagi does with her transformation pen. 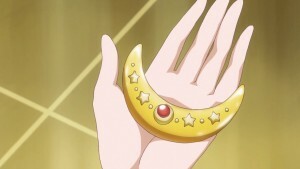 In the original Sailor Moon anime Minako does not have access to such an item as when she disguises herself as Sailor Moon in Sailor Moon S she states that she borrowed Usagi’s pen to do so, which she should not need to do if she had the ability to do so with her compact. This makes one wonder where old transformation items end up. The ones that aren’t hurled into masses of evil energy or dropped in alternate dimensions before the world is recreated I mean. 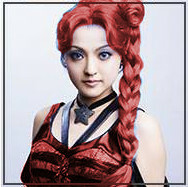 Anyway Minako decides to transform into a boy. 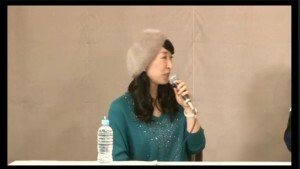 An odd decision since there are a lot of female fans at the concert, but this is something she choses to do. 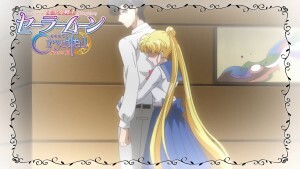 It was nice to see this scene actually remain in Sailor Moon Crystal. Back in Act 5, when Sailor Jupiter first appeared, the manga had Usagi transforming into a man at the bridal shop. 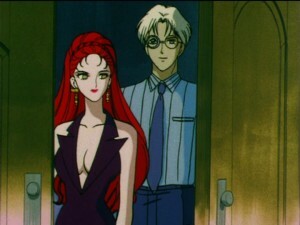 For whatever reason this transformation was not included in Sailor Moon Crystal and some fans speculated that it was because it had a character changing their gender. Whether or not this was truly the reason this does not seem to have been a problem with this episode. 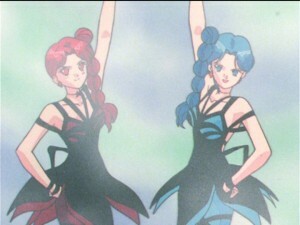 While posing as a boy Minako is clearly attracted to Mimete, complete with the hearts all around. Mimete of course is evil and part of the Witches 5. They don’t mention her power level but it’s 40. Why are we sending the weakest one second? 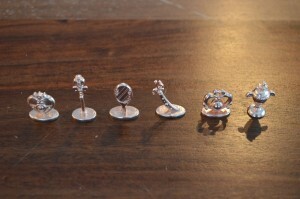 This is a messed up RPG strategy. 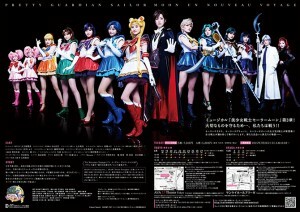 Finally the two new Sailor Guardians reveal themselves to be Sailor Uranus and Sailor Neptune. 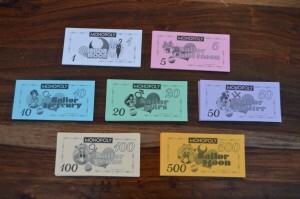 Did anyone not know these names at this point? They also use their attacks which is cool enough. 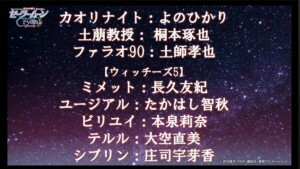 Next week is Act 30, Infinity 4 – Sailor Uranus – Haruka Tenoh – Sailor Neptune – Michiru Kaioh. 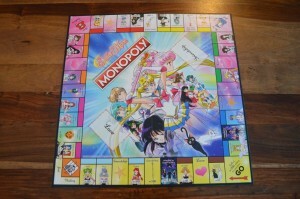 In it Sailor Mercury faces off against Viluy of the Witches 5. She’s power level 202 if that seemed important to you. Keep reading for more screenshots from this episode and the next episode preview for Act 30. 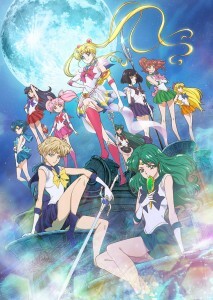 The next new episode of Sailor Moon Crystal will air in Japan on Monday April 25th at 11pm Japan Standard Time. It will be available to stream on Crunchyroll, Neon Alley and Hulu immediately afterwards starting Monday morning at 10:30am Eastern Time, 7am Pacific Time. 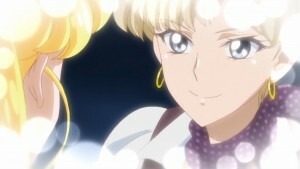 Act 29, Infinity 3 – Two New Soldiers, has Sailor Uranus kissing Sailor Moon and these two are definitely not cousins! 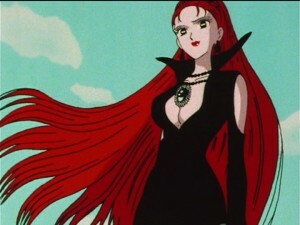 The villain this week is Mimete of the Witches 5 5 and she’ll be facing off against Minako. Readers may notice the lack of screenshots despite the fact that a preview for Act 29 was no doubt included with Act 28. Since I’m traveling this week I scheduled this post ahead of time, prior to the release of Act 28, and used some images from the equivalent manga chapter as teasers. 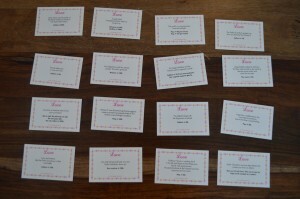 I’ll try to get updated with all of my reviews soon enough. 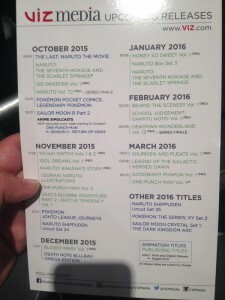 The two latest episodes of Sailor Moon S have been added to Hulu and Neon Alley. This week we focus a lot on boy crazy Mimete and her crazy antics, as well as getting a good look at Hotaru and her mysterious past. Episode 114, I Love Idols: Mimete’s Dilemma, has Mimete and Minako facing off against each other in a contest to find the lead in an idol’s next movie. 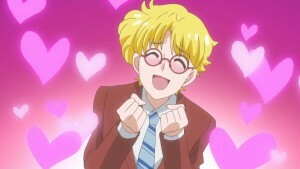 Jinta Araki is a heartthrob that both Minako and Mimete are infatuated with. 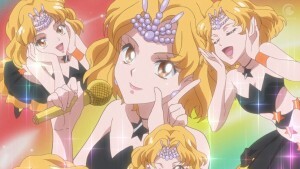 Minako has long had a dream of being an idol, and this fits right in with that. As with many other times in the series, this creates a situation where one of our heroes befriends one of the enemies without realising what is really going on. 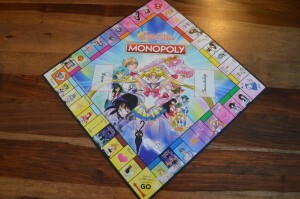 The contest goes well for Minako, who is quite surprised by her success. She passes the swimsuit part of the contest, which will please a certain reader who is a big fan of episodes with swimsuits. She makes it to the final five before being cut, though she will do much better in a later episode. Mimete loses and, as always, freaks out and attacks the target who she was previously infatuated with. Mimete is like Kirk from the original Star Trek series who would frequently kiss a girl and then hit her all in the same episode. Episode 115, Shadow of Silence: The Pale Glimmer of a Firefly, is all about Hotaru. The title is a pun in Japanese, as the word “Hotaru” means firefly. 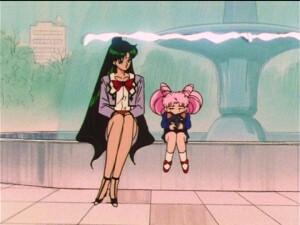 The episode starts out with a nice conversation between Setsuna and Chibiusa. Even though they were BFFs in the future, they don’t get to interact much in the present time. There’s little question at this point as to whether or not Hotaru is the Messiah of Silence who her father, Professor Tomoe, is talking to. When she has pain during their conversation we immediately cut to Hotaru in pain on her bed. 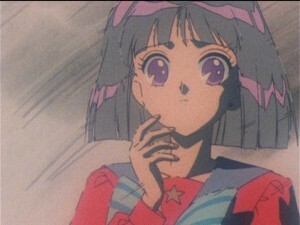 When Chibiusa visits Hotaru she is turned away, but Hotaru pursues and reveals the full extent of her health problems when she falls ill and needs to be hospitalised. In some flashback scenes we see a lot of what has been going on with this girl. She has some sort of dangerous ability which first manifested itself when she was a child and killed a fish. Later we see her in school when she unknowingly hurt a boy in her class. 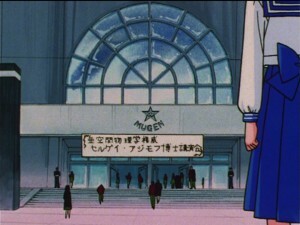 Her school uniform in this scene is from the Mugen Academy, which Haruka and Michiru also attend. 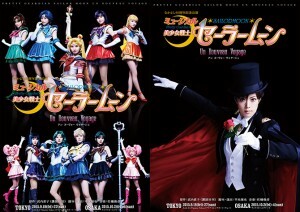 The two latest episodes of Sailor Moon S were added to Hulu and Neon Alley this morning. This week we get episodes 112 and 113 which focus on a new character, Hotaru Tomoe, and her mysterious family. Episode 112, Who Is the True Messiah? Chaos of Light and Darkness, doesn’t really deal with who the true Messiash is. 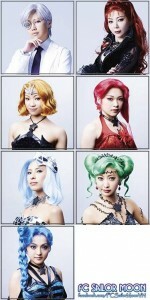 The new villain, who we saw last week, is Mimete of the Witches 5. We also get a look at her in the Death Busters’ HQ with Cyprine in the background. Mimete is kind of insane. She killed Eudial in the last episode and is all over the map this week, first falling in love with an actor and then attacking him and ripping out his Pure Heart. 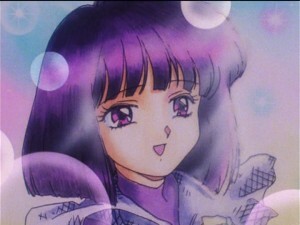 The main thing which occurs in this episode is the first appearance of Hotaru. We saw her briefly in the last episode but we get a proper look at her here. 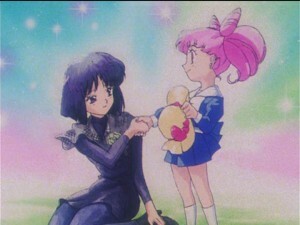 Chibiusa loses her hat and Hotaru helps her retrieve in. The two are instant friends. 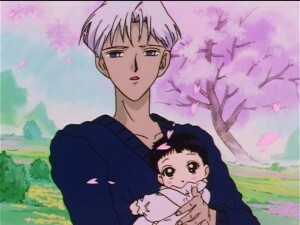 This is the special encounter that Neo Queen Serenity told Chibiusa she would be making in the 20th century. We’ll be learning much more about her as the season goes on. 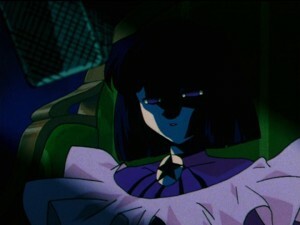 Episode 113, A House Filled With Evil Presence: The Beautiful Hotaru’s Secret, does not actually explain much about Hotaru’s secret. This episode features a very exposition filled interaction between the Sailor Guardians of the outer solar system and Tuxedo Mask. Everyone transforms for the sake of transforming without a villain in sight, which is a bit of a waste. We learn that Sailor Uranus, Neptune and Pluto protect the solar system from outside invaders while the Sailor Guardians that appeared previously protect against things from inside the solar system, like we had in the first two seasons. They aren’t too fond of Sailor Moon. Chibiusa and Usagi pay Hotaru a visit at her home. There they run into Kaolinite, who is somehow not dead. Usagi is shocked by this, as she encountered her in battle many times. Chibiusa arrived after Kaolinite’s supposed death so she doesn’t see this as odd. 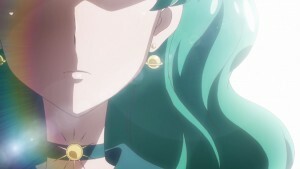 Somehow Kaolinite does not recognize Usagi, who she encountered in civilian form on her birthday, and Usagi just shrugs the whole thing off thinking it’s just a similarity. 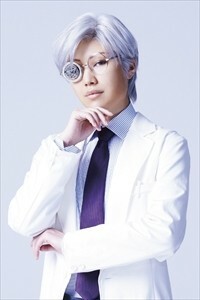 We see Professor Tomoe, Hotaru’s father, and here it is revealed who he is. Not much sense hiding it as we know his last name already. We also see him talking to a weird zonked out Hotaru who seems to be the Messiah of Silence. Will Hotaru destroy the world? 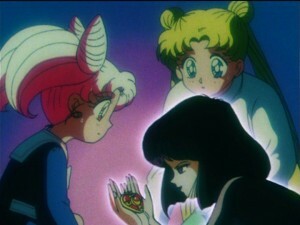 She seems like a nice innocent girl, but when she comes face to face with Usagi’s broach, which contains the Silver Crystal, she sort of freaks out and seems to want to eat it. Surely this is not the last we’ll see of Hotaru as there is more going on with this girl and her creepy family who are clearly associated with the season’s villains.